Telmate's tablets and software for inmates is purchased by their friends and family who have access to funds. It's an interesting challenge to promote services to one user and leverage that user's influence on another to purchase on their behalf. That challenge was compounded by a fractured experience over a varied landscape of devices for both personas including kiosks for inmates, kiosks for family, mobile apps, tablet apps, desktop websites, and phone (IVR). My team was responsible for defining the unification strategy by working with multiple development teams, legal, reporting, marketing and leadership. Over the years Telmate had evolved from a telecom company into a technology company, primarily led by engineers without design input. The result was a fragmented user experience across all touch-points that frustrated end users and data analyst alike. A collective hypothesis was that the resulting friction caused by both the fragmentation and poorly designed user flows was resulting in lackluster revenue performance. 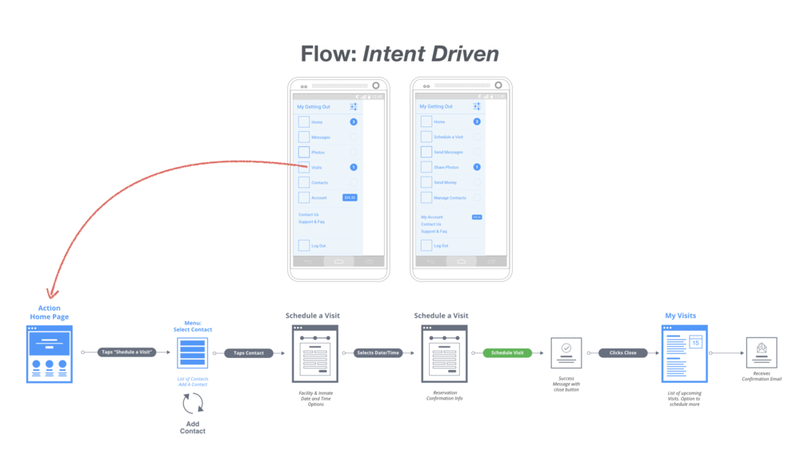 Therefore, we set out to determine a unification strategy, including a redesign of key adoption events like onboarding, to remove friction and deliver better data.